In 1879, a branch line of the Union Pacific Railroad was built from Duncan to Sioux City. Humphrey was a direct result of this railroad settlement. 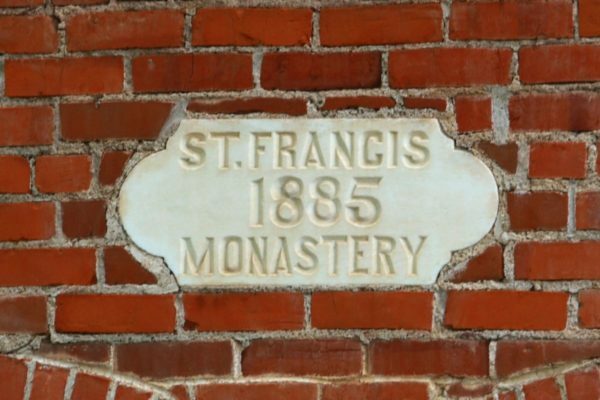 Since the railroad didn’t pass through the St. Mary settlement, Catholics were finding the trip to St. Mary Parish troublesome, especially in bad weather. 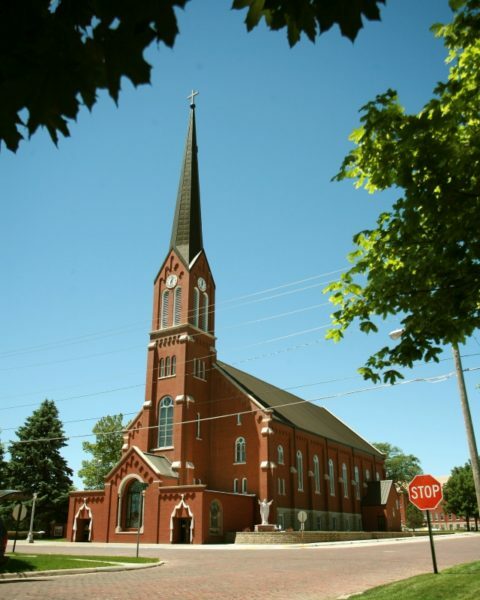 In 1881, Humphrey residents petitioned the Bishop for a church of their own. The request was turned down. 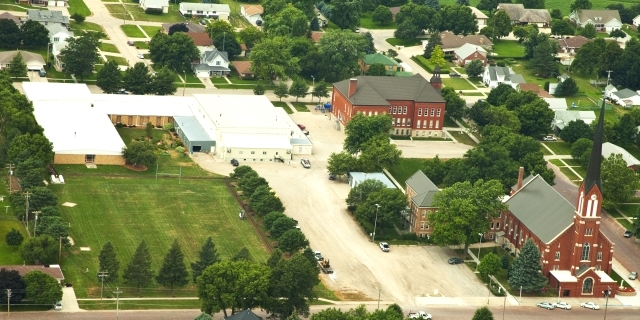 When the school at St. Mary Parish had to be enlarged because so many students were coming from Humphrey, the people again requested a parish of their own. On October 1, 1882, Fr. 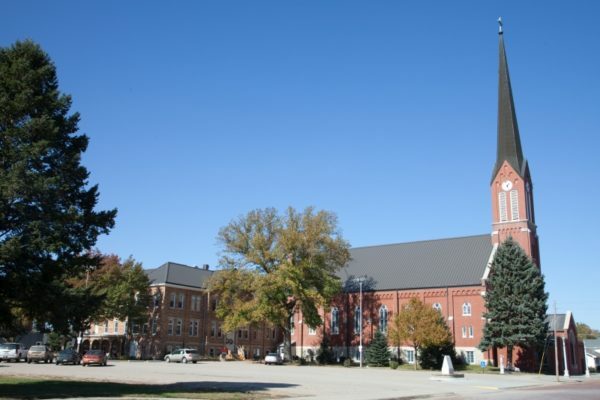 Theodore Arentz, O.F.M., pastor of St. Mary, announced that permission was granted by the Bishop and Franciscan Provincial to build a church in Humphrey. The original church frame was 32x64x16 feet with a 64 foot steeple. The church was dedicated on July 10, 1883. Due to the building of the school, the population increased and the church became too small. The building was cut in the middle and the west part was moved out and the intervening space filled in. In 1888, the parish had 180 families and again, the church was too small. It was decided at this time to build a new church. Since the new church was to occupy the site of the old church, the frame of the church was moved a few hundred feet to the west and used for services while the new one was being build. This Romanesque church was 64×172 with a steeple of 172 feet. Its seating capacity was 800. The tower of this church was ideal for a town clock so at the request of the citizens of Humphrey, a large tower clock was installed in April 1899. In 1922, new shingles were put on the roof of the church at a cost of $1,734. On September 26, 1945, a bolt of lightning struck the church tower. Had it not been for the lightning rod, there might not have been a tower left. It burned out all the sockets of the tower lights and some sections of the electric wire. In May of 1956, the cross and ball atop the church steeple was removed and gilded. The cross is seven feet two inches tall and the ball is three feet high. From the bottom of the ball to the ground it was 162 feet. The cost of the gold leaf was $639. On August 9, 1962 at 4:00 a.m., lightning struck the base of the wooden part of the steeple, causing a fire that burned out of control. The upper part of the steeple, half burnt, was blown onto the roof of the church. Fortunately, it landed on one of the strong joist supports and did little damage to the roof. Had it not hit such a support, it would have fallen through the roof and the church would have been lost. The clock mechanism was not harmed by the fire, but the clock faces were burned out. Insurance covered the $13,000 loss. On December 8, 1963, the church steeple was finally repaired and rebuilt; the workmen put the hands on the clocks as the final touch. On October 15, 1968, lightning again struck the church tower. This time no fire damage incurred and total damage amounted to $498.67, which insurance covered. In 1970, the church bells were electrified so that both bells and clock would ring automatically. In February 1971, lightning again struck the church tower, affecting clocks, bells, the loud speaking system, and some wiring in the church basement. During the summer of 1971, the north entrance of the church was built, along with a bathroom. In September of 1973 the elm trees in front of church had to be removed because of Dutch Elm disease. In 1977 it was found that the fire of 1962 had done more damage than originally thought. All loose mortar and brick were repaired on the church tower. A new steel A frame support was erected to relieve the pressure of the tower as well. Thermo glass storm windows were installed in the summer of 1978. Screens and hoppers were installed on the 13 large windows in the body of the church. The wood was painted after the old storm windows were removed. Work started on October 1, 1979, with the concrete in front of church being broken up and removed, to begin enclosing the front entrance of the church. On November 9, 1984, lightning struck the church, friary, and martin house in the garden. It knocked out the public address system in church. In the fall of 2005, tuckpointing and brick repairs were done on the church through the institution of a Building and Repair Fund. Weathered and deteriorated bricks and grout were removed, replaced with new, and a water-repellant sealer was put on for longer life. Loose bricks in the steeple were replaced and the clocks were repainted. A new steel roof was installed on the church in 2006. 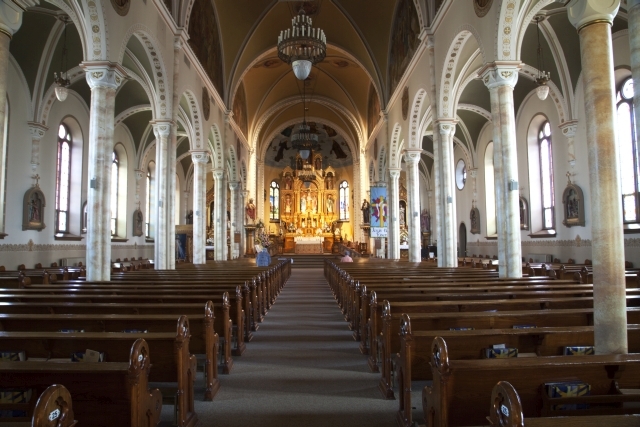 The first Solemn High Mass was celebrated July 10, 1883, in the original church. After an expansion in 1891, the church again was too small. The present church was built on the foundation of the original church in 1894. The walls and ceiling were decorated by William Kloer of St. Louis for $1,000. The pews cost $1,600. All other interior furnishings were donated by the parishioners. The high altar was donated at a cost of $1,200 and each side altar at $300. The stained glass windows in the sanctuary cost $150 each. Heating was not installed until December of 1897 at a cost of $1,630 so mass was celebrated in the basement during the winter until then. Electric lights were installed in this church in 1901 and electric current was supplied from dusk to midnight. In November 1901, a splendid pulpit and two fine confessionals were added to the church at a cost of $275 for the pulpit and $200 for the confessionals. In 1915, an electric organ, costing $3,500 was ordered and dedicated on October 24th. Electric lights were installed on the altar in 1922. The new church of St. Francis was in need of interior redecoration around 1924. The large fresco above the high altar and the eight murals above the arches date to that time. The large fresco cost $6,000 and the murals each cost $100, which were donated by parishioners. The present organ was purchased in 1926 at a cost of $5000 plus the trade in of the old organ (valued at $1,000.) It is an electric-pneumatic Hillgreen Lane double manual pipe organ, manufactured in Alliance, Ohio. In March of 1947, a new pulpit was donated at a cost of $586. The old pulpit that was mounted high on the pillar on the south side of the church was removed. In April 1948, a new roof, asbestos shingles, was put on the church at a cost of $3,990. Gutters and spouts on the entire plant were also repaired at an additional price. In February of 1955, the church organ was renovated at a cost of $1,585. In October of 1959, the work of tuckpointing the church was completed at a cost of $9,025. The interior of the church was then repainted and redecorated. The cry room was also completed at this time. In the fall of 1966, an elevator was installed it the rear of the church. In January 1971, a major overhaul of the church organ was necessary, costing $2,855. In April 1974, the lights on the High Altar surrounding and above the crucifix were put into working condition. This was done and the arch lights were again used after being out of service for some time. In June of 1975, work began on cleaning and varnishing all the church pews. In 1976, a complete new sound system was installed and used for the first time at midnight Mass that year. At the same time, preliminary steps were taken to rewire the church. In March of that year, the east entrance to the church was remodeled. It was repainted, carpet was laid, and new railings were installed for the steps. Thermo glass storm windows were installed in the summer of 1978. Screens and hoppers were installed on the 13 large windows in the body of the church. The wood was painted after the old storm windows were removed. A year later, it was decided to enclose the front entrance. Two stained glass windows from Sacred Heart Church in Cornlea were renovated and installed, as well as one new stained glass window depicting the joyful St. Francis. This renovation was completed and solemnly blessed on Thanksgiving Day of 1980. On January 17, 1981, ceiling fans were installed. New glass doors between the front entrance and the church proper were added on June 24. That same year it was determined the church needed some renovation due to falling plaster and needed to be repainted. At that time, the old communion rail was removed and new sanctuary furniture was made from it. The renovated church was blessed and used on December 19, 1981. The summer of 1996 allowed parishioners to worship in an air conditioned building through an alumnus’s donation. After a generous donation of material in 2000, the kneelers were recovered by volunteers. In 2008, repainting and restoration of the church interior was done by McGill Painters in preparation for the 125th celebration. During this time, mass was celebrated in the church basement. At this time, all the church pews were removed to be revarnished. The old carpet was removed and carpet was laid, now covering the tile under the pews. The east entrance of the church was also painted and new carpet laid. Hand rails were installed on the stairs leading up to the main altar in the summer of 2008. In 2009 a statue of St. Peregrine, patron saint of cancer patients, was added to the back of church. As soon as the new roof was placed on the present church, mass was offered in the basement and the old church was torn down. Heating was not installed in the church until December of 1897, so mass was celebrated in the basement during the winter. During the reconstruction of the friary in 1912, the friars lived in the basement of the church and some school classrooms. In 1917, new pews were bought for the winter chapel (church basement) for $1,231.40. During the winter months of 1966-1967, the church basement was remodeled and became a parish hall. Cost of remodeling the hall was approximately $3,800, but all the material, equipment, and labor was donated with the exception of $12. It began to be used as parish hall in April of 1967. In January of 1971, the kitchen in the church basement was remodeled. The ceiling was dropped, a wall was knocked out to make the room larger, a new floor laid, and a double sink in the middle of the room were installed. In the hall, the radiators were removed, excess fixtures were removed, and the hall was varnished and painted. All costs and work were donated. During the summer, a new entrance on the south side of church leading into the basement was created. In September 1972, cabinets and utility closets were built inside the new south entrance to the basement of the church. In 1976, electric hand dryers were installed in the washroom of the church basement. During the church renovation of 1981, mass was celebrated in the church basement on weekdays and in the gym on weekends. Mass was also celebrated in the basement during the church remodel of 2008. In January of 2011, construction began to renovate the parish hall. At this time, the wooden floor was removed, exposing the supports. Sand was pumped in to fill the area and a cement floor was laid. All the kitchen cabinets were removed, a new cement floor was laid, and a ventilation system was installed on the south end. The bathrooms near the north entrance were also remodeled. A unisex bathroom was created and a furnace closet was created. During this time, it was also decided to update the heating system, as the old boiler system wasn’t the most efficient. New windows were also installed to help with the heating efficiency. The old stained glass windows found in these windows were removed, restained and painted, and place back in the windows. New walls and ceiling were installed and painted. The project was completed in May of 2011 with the help of many volunteers.